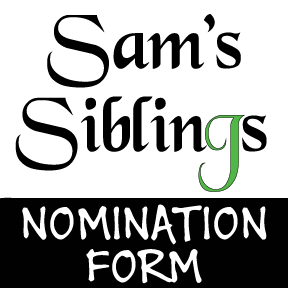 Use this form to nominate an amazing child to be an official “Sam’s Sibling.” The only requirement is that the child must have a brother or sister that is battling a critical illness. We have limited resources but lots of kindness and love. We appreciate you taking the time to help a child in need and will do our very best to show this child some love! In a world where you can be anything… thank you for being so kind. Please click Next and fill out as much as you can before hitting Submit on the next page. Please provide as much information as you can so that we may get the right donors and facilitators in place to make a special day filled with smiles. What could we provide to make their day special?